"Big (1988)...but with super powers." That's what Shazam! has been billed as prior to release. But it's more than that. It's an affirmation as to why these types of characters have endured for almost a century in popular culture. If Justice League was Warner Bros' first step in bringing fun back to their DC Extended Universe brand, Shazam! cements it. While more based on the 2011 comics relaunch material than the original version of the character, the film is sure to win over purists, casual fans, and non-fans. The basics of the mythology established by Bill Parker and C.C.Beck's creation remain the same: Young orphan Billy Batson (Asher Angel) is chosen by the ancient wizard known as "Shazam" (Djimon Hounsou, building serious comics cred) to become the champion bearing the wisdom of Solomon, the strength of Hercules, the stamina of Atlas, the power of Zeus, the courage of Achilles, and the speed of Mercury. However, in this case, his choice is predicated by necessity due to the release of the Seven Deadly Sins of Man by Thaddeus Sivana (Mark Strong, in DC's soapbox again after his turn as "Sinestro" in the abortive Green Lantern (2011)). Billy's life is replete with unwanted conditions, and he must learn to navigate them and his newfound abilities as the grown-up Cap...Shazam (an incredible Zachary Levi, Chuck)...lest Sivana and the Sins take that power for themselves. While this sounds like yet another dark entry into the DC films staple, it is quite the opposite. While it does deal with heavy themes, in some ways less effective than others, it also offers a light-hearted, fun aspect to being a super-hero. 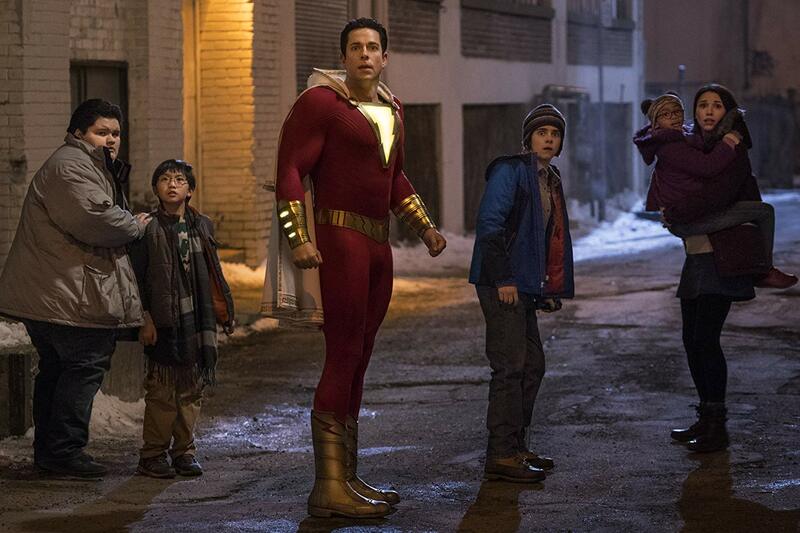 Unlike previous iterations wherein the boy and the man were two distinctly separate personalities, here Billy and Cap...Shazam...are literally of the same mind and, along with his foster brother and self-proclaimed super-hero expert/fanboy Freddy Freeman (It's Jack Dylan Grazer), show a less heroic, yet arguably more realistic portrayal of a scenario wherein one is suddenly gifted with extraordinary abilities. It's Levi's realistic portrayal of a boy in a man's body...and his ability to capture Angel's personality without delving into parody, that sells this film in its entirety. His energy is infectious and the viewer cannot help but be drawn in by it. Director David F. Sandberg, working from a screenplay by Henry Gayden and Darren Lemke, endeavor to make magic, both literal and figurative, onto the big screen, even if it borrows concepts from franchises such as Harry Potter and Monsters Inc. to do it. And for the most part, they succeed. The film emphasizes fun with a capital "F" (showing respect to the concepts and history of the character) while at the same time handling weightier affairs such as child disenfranchisement, societal marginalization, and what it means to be "family" with mixed, short-changing results. Certain arcs, such as that of Grazer's Freddy, don't carry quite the heft they should. Its internal logic falters somewhat (Billy's possession yet lack of utilization of his power pantheon gifts in certain circumstances, for example) and the narrative contains pacing issues which undermine the whole. 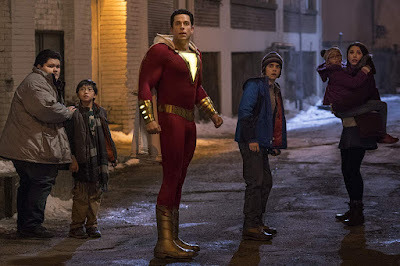 However, humor is at the forefront, from fish-out-of-water scenarios to the deft, tongue-in-cheek references and handling of Cap...Shazam's legal history regarding the character's name (which this purist author still has to reconcile, as if you couldn't tell) which is shared with another recent film by the Marvelous competition. It's that fun factor that overrides the films weaknesses. Despite it all, its the first "happy" film the DCEU has had since its launch. It's clear that everyone is having a ball, from Angel's Batson, whose performance is eerily reminiscent of a young Tobey Maquire, to Strong's Sivana, who manages to exude super-villain menace without over-the-top "mustache twirling". But watch out for Faithe Herman as "Darla", one of Billy's foster siblings. She's so precocious she steals every scene she's in and melt's the coldest of hearts. There is not one sour note in the entire cast. Benjamin Wallfische's score is the film's acoustical mission statement, even as it borrows melodies from other superheroic franchises (one that is definitely intentional in a good way). The visuals are as bright as they've ever been in a DCEU entry (without going into Technicolor-overload as in the recent Aquaman), and the pop culture references are sure to bring smiles to comics and non-comics fans alike). Shazam! is filled with stakes, adventure, and heart...so much so, I half expected the late Stan Lee (or even Tom Hanks) to cameo. However, this film is no Marvel Studios rip. It's a film that provides a tonal course correction while at the same time serving as one of the more feel-good film entries of 2019. Shazam! casts a beguiling charm spell that will engage even the most jaded view. It captures the essence of the mythology (and the hopeful adventure it entailed) that enthralled a certain child to risk parental ire by breaking the antenna off an 70's-era AM/FM radio and, clad in nothing more than a white bath towel cape tied around his neck and his tighty whities, running and hoisting said antenna into the air and hollering "Shazam!" at the top of his lungs in the middle of a lightning storm (needless to say, the hide-tanning received was more painful than the possibly averted lightning strike). Shazam! is the closest that the DCEU has come to providing a comic book experience certain to charm both kids and adults alike, and that is certainly a cause for a celebratory dance.